On Monday, David Saint-Jacques began his journey to the International Space Station, becoming the ninth Canadian in space. Before blasting off, he spoke to Quirks & Quarks host Bob McDonald about the mission. Update Dec. 3, 2018: Canadian astronaut David Saint-Jacques is on his way to the International Space Station (ISS) with two other astronauts after a Russian Soyuz rocket blasted off from Kazakhstan Monday morning. 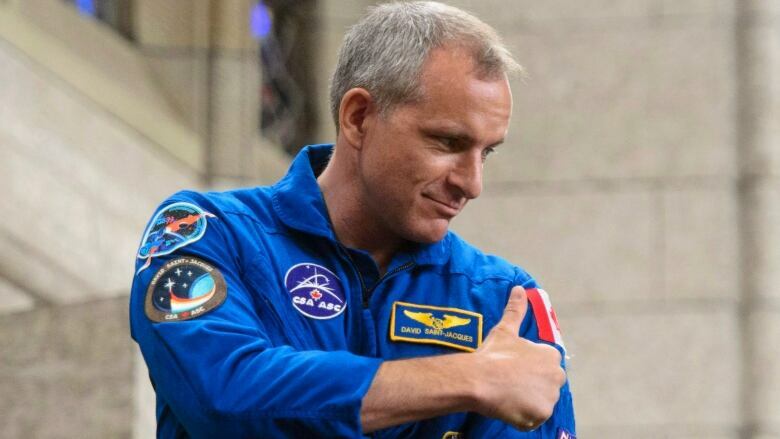 On Monday, if all goes well, physician, engineer, astrophysicist and astronaut David Saint-Jacques will become the ninth Canadian in space. The 48-year-old St.Lambert resident, will blast off from the Baikonur Cosmodrome in Kazakhstan on his way to the International Space Station for a six-month mission to run a gamut of experiments. After years of training, Saint-Jacques is looking forward to his time on the International Space Station. In a brief conservation with Quirks & Quarks host Bob McDonald, while waiting for the launch in Kazakhstan, he talked about how busy he'll be, the rigors of six months in zero gravity, what it does to the human body, and Canada's future role in space. Bon voyage, David—we'll be looking up at you, looking down on us next week.